So basically every drive in the car triggers a weird middle school/high school flashback sprinkled with just enough current stuff to keep me from thinking I’ve accidentally entered a hole in the space-time continuum. Also, notice what’s missing? German artists singing German songs! I’d say 95% of the music on the radio is American/British. Which is familiar and fine, but not the cultural immersion I hoped for. Thankfully I have streaming radio and some good playlists made by cool friends. Perhaps it’s the all that industrial grey tile. Perhaps it’s some sort of Freudian complex. 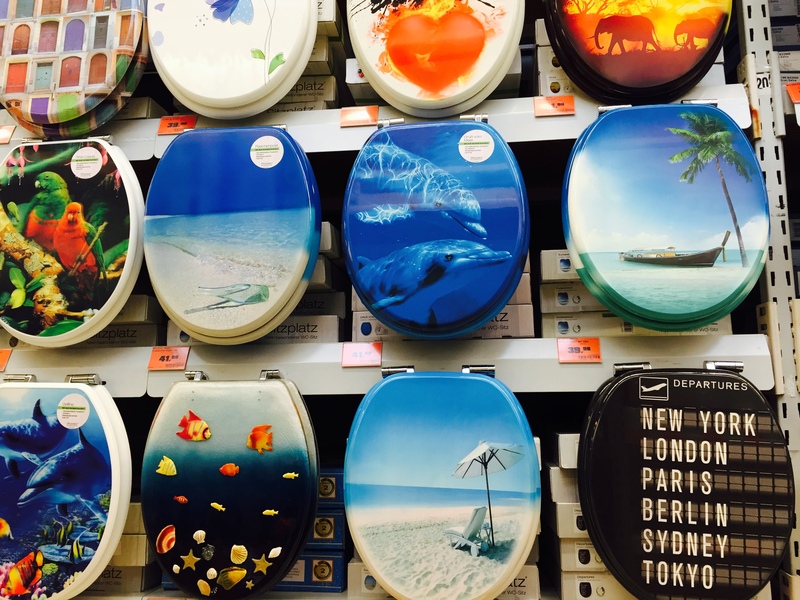 But Germany seems to think that the best place for self-expression and visual meditation is the lid of the toilet. When we were looking for a place to live, every house–and every bathroom in every house–had a decorated toilet lid. Beach scenes, cityscapes, God help me inspirational messages are all common. A sample of the selection available at the local hardware store. The one on the lower right is my favorite–because apparently I have the humor of a 12 year old. “Departures” Hee Hee! Open, closed, how quirky can it be? But here in Germany there are, of course, many unspoken rules for proper window usage. 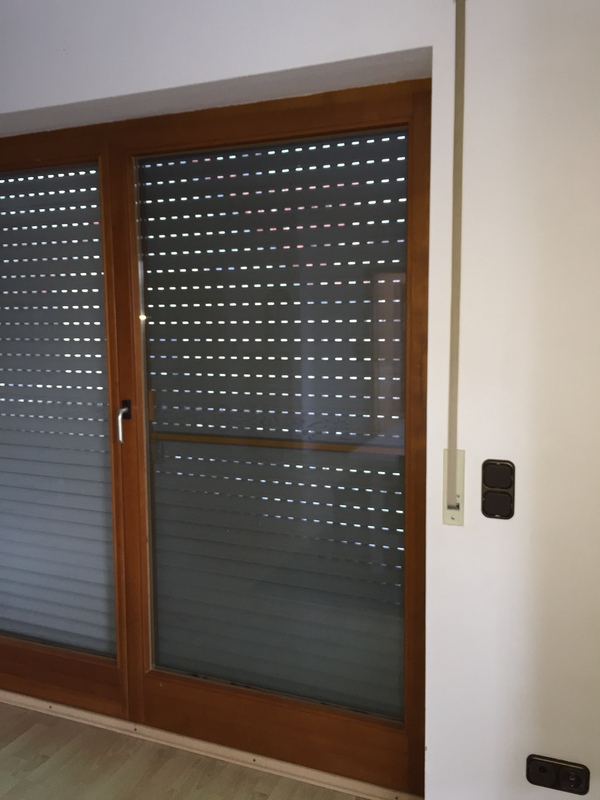 In most homes and businesses there is a metal outer shade that needs to be ritually opened and closed each day. Each night, it is lowered (and since it is made from sheets of interlocking metal, your neighbors will hear the exact time you do it and know that you are in for the night) giving your home the look of hurricane protection from the outside and a war-time bunker on the inside. Then each morning, the outer shade is raised (alerting the neighbors that you are now awake). While new construction has motorized this function, in homes more than 10 years old, the mechanism for all this raising and lowering is a canvas strap connected to a pulley system inside your wall. So every window has its own strap. Meaning your wall is striped with straps. They kind of remind me of those old-fashioned cloth towel dispensers in public restrooms, but without the ability to take them out for cleaning. It also means painting your walls gets an extra challenge, but that’s not my problem. Yay for renting! The metal shade on every German window does feature the option for pinholes of light when closed. You know, to make the place more homey. And to accent the charming pull strap to the right. Oh how I miss the lazy American ways of single-sort recycling! Even Germans admit their method can be confusing. On the plus side, this country is fantastic at recycling. Almost everything can be recycled in some way. But on the minus side, I have EIGHT areas under my sink for waste. 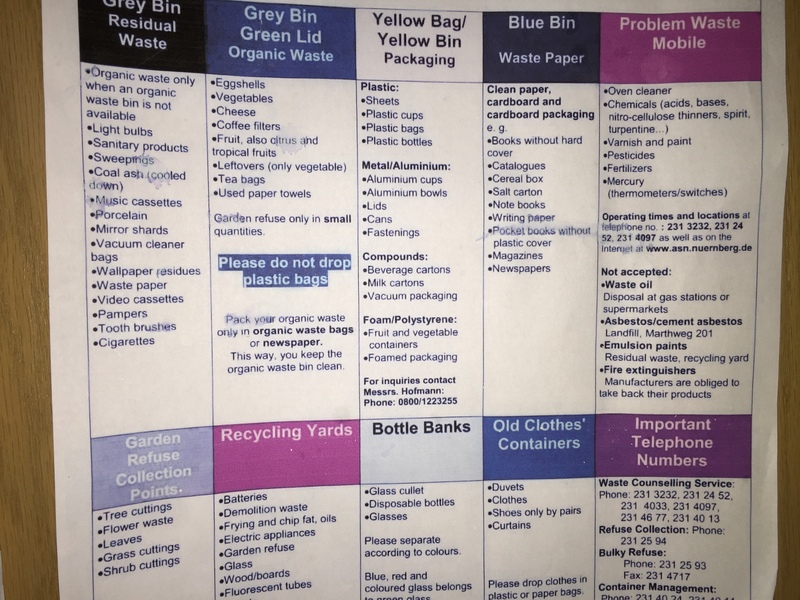 Let’s count: There is a bin for paper, a bin for compost, a bin for recyclable packaging (which can only go in special yellow bags provided by the city), a bin for “garbage”, an area for glass bottles, an area for cans, an area for plastic drink bottles and an area for refundable-deposit bottles. There is another layer to this, and that’s the pick-up schedule. Paper and recyclable packaging are picked up once a month and compost and “garbage” are picked up twice a month. Glass bottles and cans need to be taken to public bins by the consumer (but not on Sundays! That’s illegal!) and refundable drink bottles can sometimes only be returned to their exact store of purchase–but sometimes you can take them to other stores. It depends on…something. I haven’t cracked the code on that one yet. Recycling is complicated in Germany. Luckily, I have this very easy-to-understand cheat sheet. Oy. I’m sure as we are here longer, some quirks will become second nature and new ones will reveal themselves. What quirks have you discovered as you’ve traveled? Come on, I mean “Abracadabra”? Classic.